Daily Illuminator: Have It All At AllCon! March 14, 2017: Have It All At AllCon! Who says you can't have it ALL? 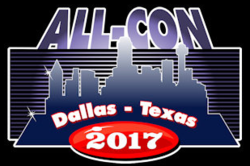 I will be traveling to Dallas for AllCon XIII, March 16-19, at the Crowne Plaza Dallas near Galleria in Addison, TX. If you're a fan of fantasy, sci-fi, anime, cosplay, and gaming, then this is the con for you! I'll be helping out our local Demo Team members Dawn and Ryan, so stop by and say "hi," and check out our hottest games. Munchkin fans will have plenty of opportunity to #PlayMunchkin! We'll be running various flavors, including Munchkin Oz with the new expansion Munchkin Oz 2 – Yellow Brick Raid, as well as Munchkin Apocalypse Guest Artist Edition with Munchkin Apocalypse: Judge Dredd. Ogre Sixth Edition, our classic game of armored combat, rumbles into the con, ready to take out command posts! If you like to press your luck, then play Batman: The Animated Series Dice Game, Zombie Dice, or Mars Attacks: The Dice Game! Attendees with a sweet tooth will be able to get a sneak peek at Ghosts Love Candy. Do you have to pass an oral history report to avoid going to military school? Then check out Bill & Ted's Excellent Boardgame. Meanwhile, fans of Simon's Cat can enjoy feline hijinks and make a mess with Simon's Cat Card Game. We're going to have a lot of fun (and swag) at AllCon, so come by our demo space, play some awesome games, and show us your #AllConSuperMunchkin post on social media to get extra swag. See you soon!